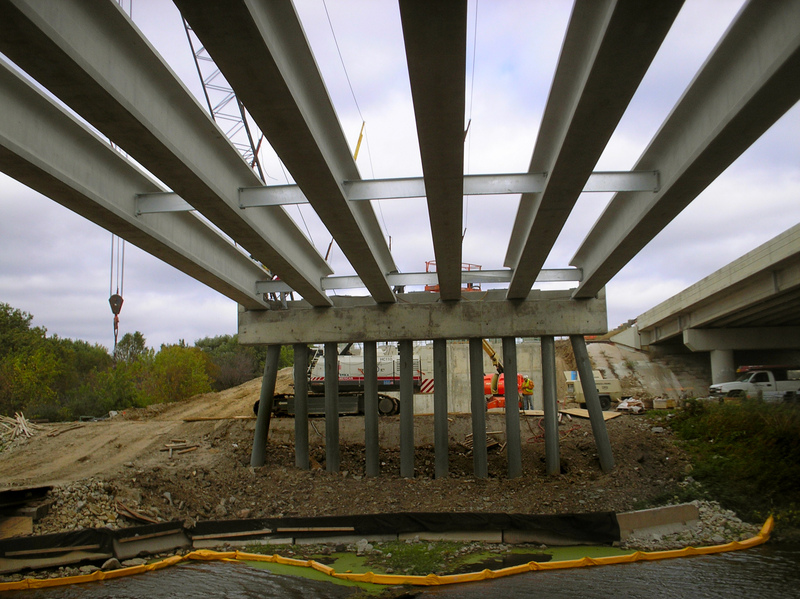 The Bridges of Mower County Design-Build project involves the reconstruction of four bridges on I-90: Dobbins Creek Bridge, Business Loop Flyover Bridge, and the eastbound and westbound bridges at Turtle Creek. The $12.8 million project was funded by the American Recovery and Reinvestment Act of 2009 (ARRA). We were retained as the lead geotechnical engineering firm to provide pavement and roadway recommendations along with deep and shallow foundation recommendations for multiple bridge and retaining wall structures. We also assisted in the formulation and implementation of the environmental management plan, focusing on contaminated soils and Storm Water Pollution Prevention. For the properties adjacent to the construction activities, we coordinated and conducted pre-condition surveys and vibration monitoring services. Our quality control testing included materials testing and pile driving analysis.